While it’s often very exciting to travel to another country, it can also bring about a lot of nerves at the prospect of having to get around a country in another language. Americans tend to be at a disadvantage when traveling, especially compared to Europeans, who learn many languages while growing up. However, that’s no reason to be afraid or not to take on the challenge. In fact, finding the confidence to travel in a foreign country with a foreign language can be a very empowering experience for many. If you’re hesitant to try, there are a handful of tips that can help you prepare for an exotic excursion into a country where you don’t know the language. This tips translate to any country and can easily help you in a pinch! 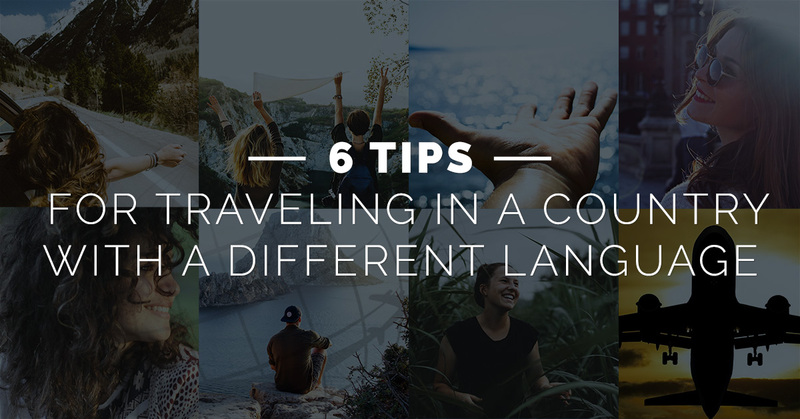 One of the best things you can do to prepare for a trip is to learn the basics in the local language. Research what languages you may come across and learn the best ways to be polite. Learn how to say “Hello,” “Goodbye,” “Thank You,” and “Please” for starters. These will get you a long way, especially since you will be showing the locals courtesy and effort. During any trip to Israel, you will encounter both Hebrew and Arabic. For your convenience, we’ve included some of the phrases you may need in both languages below! You will find the English, followed by the Hebrew and Arabic with some of their pronunciations. Hand gestures can be universal. In fact, if you’re a Charades expert, you’ll probably thrive in a foreign country. Being able and willing to pantomime what you need can help you a lot. However, be careful to know what hand gestures may not be appropriate in certain countries. Signs like the classic “okay” hand sign can be construed as rude in places like Turkey. In the Middle East, it’s also not ideal to eat with your left hand, as many countries around the world see the left hand as unclean. Just make sure to check, but for the most part, miming what you need will get your far. If you’re not a fan of Charades, perhaps you’re a Pictionary aficionado instead. Keeping pen and paper on you at all times will always come in handy. From writing down an address in the local dialect to having paper to draw out your needs, you won’t regret toting around these items, because they will be invaluable. If you do happen to have your phone on wifi or have it set up for phone service, it will be an incredible asset to you. Many apps are available to help you translate street signs or even facilitate a conversation in two different languages. Even though there are a bunch of paid apps, our go-to is still Google Translate. They also added a new feature called Word Lens where you can take a picture of a sign and it will translate it for you. Another part of traveling in another country is knowing where to go for help. It may seem easiest just to stop someone on the street, but with language barriers, it’s actually not your best bet. Of course, you can always look for a younger individual who will probably have some level of English skills, but the best approach is actually to pop into hotels and restaurants for directions. It doesn’t matter if you’re staying at that hotel, if you’re lost, you can easily pop in and chat with any concierge desk to get headed in the right direction again. The last option you have available to you if you don’t want to venture through a foreign country on your own is to work with a tour guide or travel group. This way, you have a knowledgeable individual with you the whole time who knows the language. They are truly the perfect resource. You can opt for shorter tours or all-inclusive tour vacations. You also have the ability to start your trip with a group tour and continue on your own after you get comfortable with the region. Here at World Express Travel, we can help you to create the trip of your dreams. We offer a variety of trips to Israel and many other customizable options around the world. Contact us today for more information and get ready for the adventure of a lifetime!